I am, embarrassingly, one of the only people I know that does not own a tablet. Even my daughter has one, albeit a really cheap, no-name one. To be honest, I just don't have a few extra hundred bucks to plop down on a new toy for myself. So, when I was asked if I would like to review one, I was ecstatic! I actually had a choice between several tablets to review. After much research and review reading myself, I was confident my choice of the Google Nexus 7 was a good one. Before I get to my hands-on review, I'd like to share some specs and manufacturer info with you. 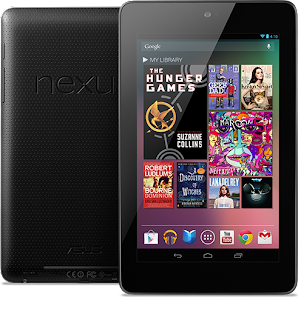 The Nexus 7 comes in two models and both are competitively priced. The 8GB is $199 and for $249 you can get a 16GB. Other than the difference in storage size, the features of both are the same. Has a 7" scratch resistant Corning glass display and a vibrant 1280x800 high-res display. Now that you know all the technical details of the Nexus 7, I'd like to share my personal thoughts on it. Of course, the first thing I noticed was the packaging. It was superb! The tablet is kept in a very thick, sturdy box inside a pretty sleeve of sorts. The sealed box slides out of it. The tablet was completely covered in a protective plastic that easily peels off. It would be impossible for a smudge of any kind to get on the tablet....it was amazingly clean. Under the tablet are the included accessories, the adapter, power plug, manual and warranty card. These are neatly tucked in a "nook" within the box, each in its own little compartment. Everything was very organized. The tablet itself has a crystal clear glass screen. The back of it has a unique rubbery, almost leather-like, cover. It seems a little more slippery than it looks like it should be, but I haven't had any issues with it slipping from my hands. It is very well-built and sturdy. The power and volume buttons are easy to find and use. Since it is a Google powered tablet, it prompted me to enter my Google (Gmail) information. It gave me the option to import all my contacts and to sync with my Google services. If you don't have a Google account, you can easily create one via the tablet. The standard home screen had a plethora of entertainment options called "My Library" that includes quick access to TV shows, movies, magazines and books. After keeping this screen for a while, I decided that I would not need these for quick access; I would rather want icons of my favorite apps on my home screen. To change this, all I had to do was keep my finger on the images for a few seconds and they then became moveable. Once they did, a "delete" icon popped up and I just dragged everything into it. This just deleted the icons from my home screen, all those programs are still on my tablet and accessible for when/if I need to use them. Once I got around to really using it, I was very happy to see how responsive it was. My fingers slid effortlessly when scrolling and text input worked great. Another notable thing is how fast it is. Thanks to its quad-core processor, I was able to use multiple apps at the same time and experience no lag or freezing. And it's a breeze to switch between running apps simply by touching a static icon on the bottom of the screen. It pulls up windows of your running apps and you just touch which one you want to switch to. I was able to install many of my favorite apps, but unfortunately, there were quite a few that were not compatible with the Nexus 7. I emailed one of my faves and asked them when an update would be made for the app to be usable with the new Jelly Bean Android. Their response was it was not compatible because there is no rear-facing camera. I'm assuming the fact that this tablet is not 3G enabled is why a lot of the other apps would not work (mainly "check-in" apps). It's important to know that this camera does not have a rear-facing camera. This means you can only take photos of yourself (think headshots) while using it. This is great for Skype users, but unfortunately for me, I don't video chat. In fact, I still have not found a way to even access the camera. The only time I've been able to use it is when an app asks if I want to take a photo to use as my profile picture. I've read that there is an app that will allow you to put a camera icon on the tablet, but I haven't checked it out. I also want to mention the sound that comes from the built-in speaker. In a few words, it could be better. Now, I'm not saying that it's bad...maybe a little "tinny" sounding. Nothing a pair of good headphones can't fix! Battery life is also important for a lot of people. I am pleased to report that the Nexus 7 lives up to its claim of battery hours! I should say that I haven't played HD video for 9 hours or used it as an eReader for 10, but I've had no issues with it. With normal use of a few hours a day, I can go a few days without charging it. Another important thing to mention is that there is no expandable memory slot. In case you don't know, this means that whether you buy the 8GB or 16GB, that is the only size of storage you can use and you can't add more via a memory card. For me personally, this is not a problem (especially since you can't take "real" photos with it). For others though, this may be an issue. In conclusion, I would recommend the Google Nexus 7. I think it would make an awesome birthday or holiday gift, especially for a tween or teenager. My 11-year-old daughter absolutely loves it and is happy that she can run a music player, while playing Angry Birds and use the internet at the same time; something that she cannot do on her "other" tablet. If sound or storage size is not an issue, you should be quite happy with this tablet. Entertainment junkies will really love being able to read the newest issue of their favorite magazine or watch last week's missed episode of their favorite sitcom with a few finger touches! I big thank you to Staples for sending me the above tablet in order to form an opinion for review purposes. No other compensation was received and thoughts are 100% my own. That sounds really great! I am putting a tablet on my Christmas list for Santa this year and I think that just might be the type I ask for. Thanks for telling me how fast and easy it is to use. I, too, have never owned a tablet before!